A traditional Derby Day drink from Woodford Reserve. Photos courtesy of Woodford Reserve. DON’T forget the mint during the trip to the supermarket because a mint julep without mint is like Champagne without bubbles: flat. Mint juleps? Why, yes. It is that time of year. 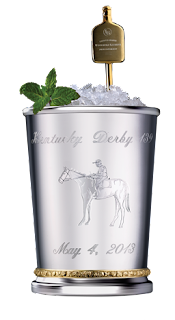 With just three days (4 May) before the 139th running of the Kentucky Derby, or Kentucky Derby 139, mint juleps are on the minds of the masses of race fans. Kentucky-based Woodford Reserve, the official burbon of the Derby, has concocted two recipes for the occasion. The aptly named Woodford Reserve Mint Julep and Woodford Reserve Race Day Tini. Yum, no? A martini of sorts for the nontraditional Derby Day tastes. Muddle (stir/gently crush) four mint sprigs and sugar in the bottom of a julep glass. Add water and continue to muddle. Add Woodford Reserve Bourbon. Pack the julep glass with crushed ice. Add a mint sprig for decoration and sipping straw. If a metal julep cup is used, be sure to use a wooden muddler (bottom of a wooden spoon) instead of a metal spoon. This will eliminate the possibility of any metal shavings getting into the drink or scratching the julep cup. In a shaker with ice, add ingredients. Shake and strain into a chilled glass. Garnish with a lemon twist. The Woodford Reserve 2013 Mint Julep Cup has very special markings. Net proceeds from the 2013 $1,000 Mint Julep Cup promotion will benefit Old Friends Thoroughbred Retirement Center, an outfit that takes care of fine equines when they are put out to pasture.